Stars were just too good for the Blitz as they restricted them to a low score of 113-7 in 20 overs. Rassie van der Dussen and Beuran Hendricks ensured that the Stars win with ease with Van der Dussen scoring a well measured 59 (54) and man of the match Hendricks taking 2-21. Enoch Nkwe becomes the first coach to win the Mzansi Super League. “I am speechless. We asked for a special performance and the guys have delivered. The bowlers were excellent to restrict them and then the batters were clinical. We wanted to keep it simple and stay aggressive. Blitz knew 113 was never enough and their bowlers had to fire from all cylinders from ball one but that was not the case as the Stars’ chase was smooth from the get go with Van der Dussen and Reeza Hendricks sharing a 86-run partnership after Ryan Rickelton was out early for 6 (8). The Cape Town Blitz opening batsmen were back in the pavilion in the first six overs of the final with Hendricks and Duanne Olivier picking the wickets of the inform Quinton de Kock 5 (10) and Dawid Malan 17 (20). By the end of the 10th over the Blitz were seeing nothing but Stars as they were crawling at 54-4. The home side kept on losing wickets at regular intervals and struggled to put partnerships together. Captain Farhaan Behardien tried to lift the spirits of the packed Newland crowd with 23 (22), which was the top score in the Blitz’s innings. Dale Steyn played a little cameo of 15 from 9 balls. Al the Jozi Stars bowlers came to the party with Hendricks 2/21, DuanneOlivier 2/32 being the pick of the bowlers on the day. Winning captain Dane Vilas said It’s an unbelievable team performance, they knew it was going to be tough but weren't expecting the pitch to be as tough as it was. “When Dale was bowling, he made us nervous. But credit to Reeza and Rassie. It's difficult in such a quick tournament like this to pull together. Blitz captain Behardien said they played as a unit throughout the league stage and they will take lessons from this from this knockout game. “We’ve done really well over the campaign. Played good cricket at times. The decision was to bat first. We felt the wicket was going to get slower and lower. We just never built up enough partnerships and we couldn't have any momentum at the end. 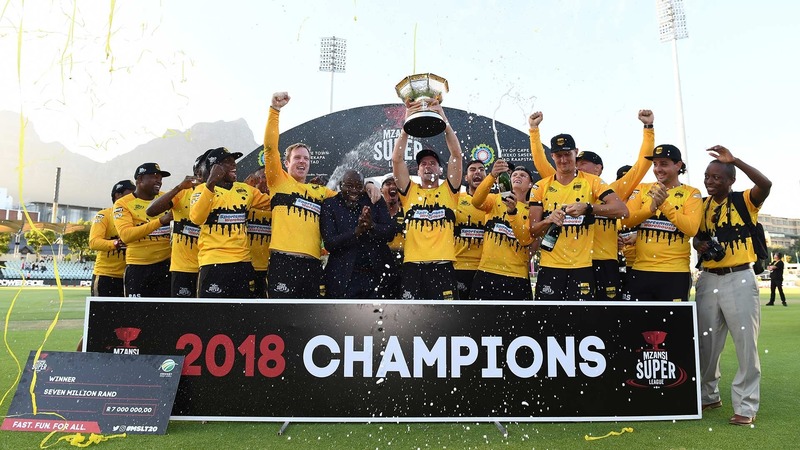 It is no surprise that the team from Jozi Maboneng are the champions, they have the tournament’s top run scorer in Van Der Dussen who has also hit the most sixes with 23, Duanne Olivier took the most wickets in the tournaments. It was an all-round team effort with all the players doing their part.